The BEG Series generators feature excellent medium and high dose rates of non-cohesive powders and dusts in an aerosol. In addition to their excellent consistency at high dosage rates, they offer the capability to dose with superior accuracy at low dose rates as well as the ability to dose consistently for long periods of time. With the benefit of an additional storage unit possessing a supplemental reservoir, the BEG Series can dose consistently for days. 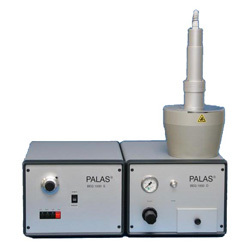 Manufactured by Palas, the BEG Series has successfully served industry for over 20 years.